Robbie and I opened up the hives a few weekends ago to take an inventory of the healthy hive and see how much brood the new queen has produced in the weaker hive. 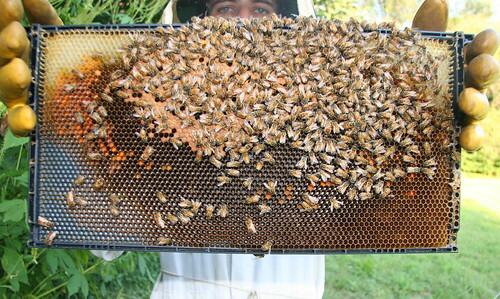 Sadly, we didn’t see a lot of honey in the honey supers (the shallower frames on top). We figured this was some what to be expected since our hive was just getting built up when most of the plants were producing nectar. 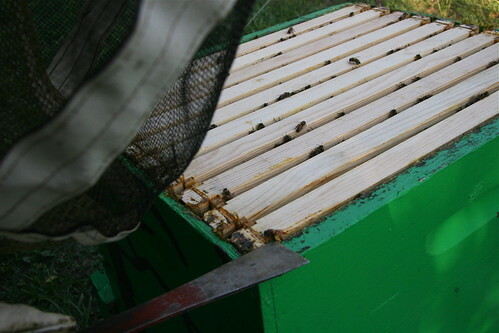 It was a timing issue, and we were late getting our hives started. 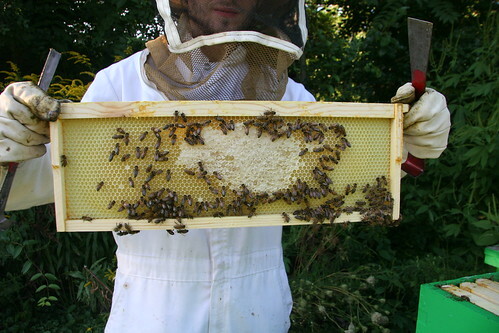 You can see that there is some capped honey in the middle, but the bees have barely drawn out the wax comb towards the edges of the frame. In the hive that recently had been re-queened, there was a clear sign that the new queen had been successfully introduced. You can see in the photo below that some of the cells have a dark yellow cap on them. That’s called ‘capped brood’, and in a few weeks fully developed bees will eat their way out and begin working right away. The brighter orange cells are pollen stores. 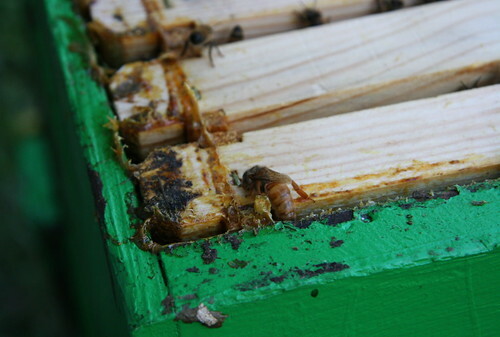 When we first opened up the second hive we immediately noticed something strange. Right in the corner of the hive that we pried open with the hive tool, there was an unmarked queen hiding out. There she is about as far away from the nucleus of the hive as possible. You can see her elongated abdomen and short wings. We were hoping to find signs of the introduced queen and maybe spot her, and oddly the first bee we see after opening the hive is another queen. 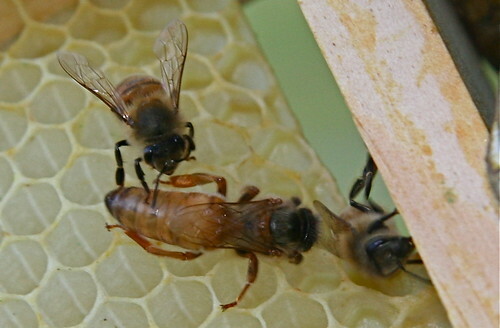 I suspect that before the first queen swarmed, the bees had already started feeding royal jelly to create a new queen. By the time she hatched we had stuck a new queen in, who has now taken over the colony. If you spend a moment to think about it, a very interesting tale of courtly coups could be extracted from this. Is the native born queen entitled to the crown? Who is this imposter queen who has stolen the throne and banished the rightful heir to the far reaches of the queendom? Did we screw up the natural order of things by adding a new queen when the bees were busy rearing a new one? We scratched our heads (through the veils), set the mystery queen aside, and continued looking for signs of the introduced queen. When we were finished and putting the frames back in we found the unmarked queen very close to where she was before. It seems as though she still had a few workers attending to her.